When entering Botswana the first thing we noticed was how green this country is. And how empty. With only 2.3 million people living in a country as big as France or Spain, you can do the math. From what we’ve heard the country doesn’t do fences around their national parks, which makes running into warthogs, zebras or elephants on the highway an ordinary case. You gotta love Africa. So one of our first stops on this road trip through Botswana is the Okavango Delta. The delta is the largest in the world and offers a great variety of game. Sleeping on the river banks we got a real good taste of the Okavango Delta from the start. An insane selection of colorful birds, animal sounds the whole day and night through, and a true African sunset that you won’t find anywhere else. We stayed at the Old Bridge Backpackers which had a real nice vibe. With outdoor showers, a welcoming bar and some front row seats at the river, they really got something good going on here. There are multiple ways of discovering the beauty of the delta. If you’d like an overview of the delta as a whole, taking a scenic flight is the way to go. The views will take you’re breath away! Even from up in the sky you can see the herds of elephants, giraffes, zebras and hippos. 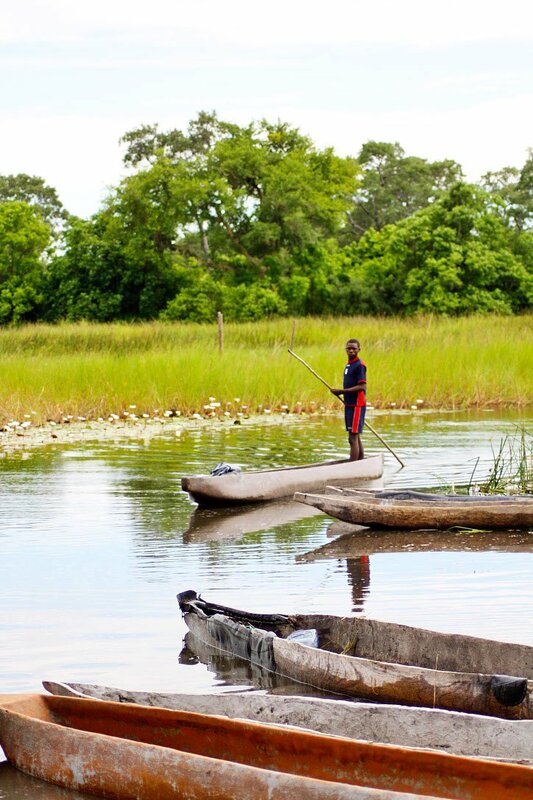 If you want to get a close up of all this beauty, then take a boat trip with one of the locals and their Mokoro boats. Going on a Mokoro trip is like going to a kids birthday party. Including the invitation with bring your swimsuit, you’ll be brought home. Being just as excited since we had no idea what we were going to do, we ended up at this little village in the middle of the delta getting greeted by a group of happy kids. Gearing ourselves up for a day in the delta with loads of sunscreen and water, we were ready to get lost in the maze of the Okavango. Rowing through the delta is really tranquil. The nature is beautiful and bumping into hippos and elephants makes it even more special. We had some very close encounters which made our tiny unstable mokoro boat maybe not the safest place on earth, but I wouldn’t have missed it for the world. After seeing all those crocs and hippos in water, this “bring your swimmers” does sound a bit doubtful. For the daredevils among us, you do get a chance to dive into the delta. Our guide didn’t see this as a problem at all, however I think I’ll pass. You go first, I’ll watch? What a wonderful day it was. If you’d like you can actually book multiple days which will take you deeper into the Okavango delta and will let you see even more animals than what we’ve already seen. I definitely wanna go back to try this for a day of three or four, eat by the fire, camp under the stars, and hear those animals wandering around. 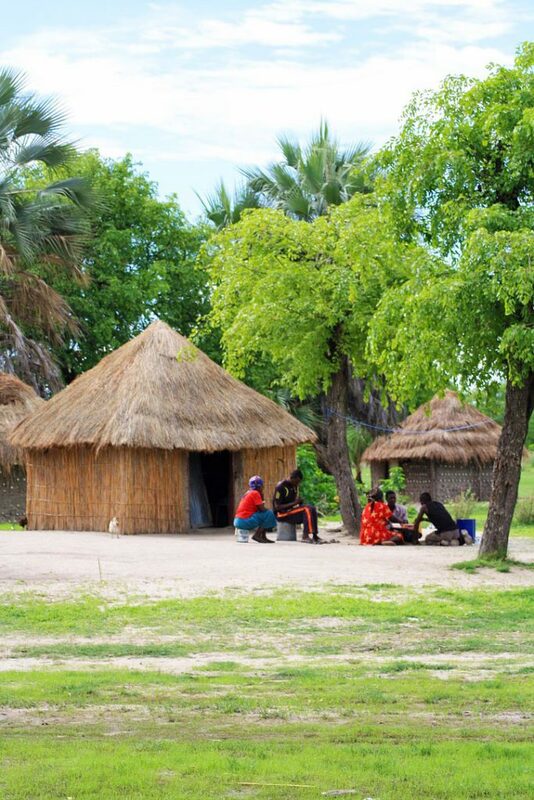 There certainly is no place like Africa, and the Okavango Delta proves just that. Great pictures, very inspiring! I’m travelling to Botswana and Okawango soon, and your pictures tell me that I’m in for a lifetime adventure! Thanks so much!! It’s a stunning country.. visit Chobe and Moremi as well, so beautiful! Have a fun trip! We had such a wonderful African experience with you both! I wish I was there to see the Elli charging Sean on the road to Kasane!